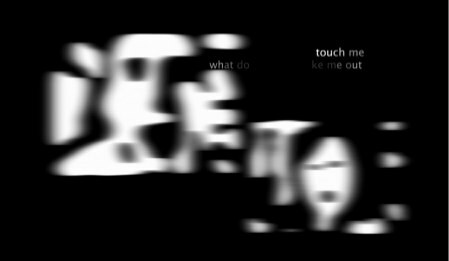 Christine Wilks’s Out of Touch is an exploration into the detachment and superficiality of virtual interaction through video poetry reminiscent of the Expressionists. The piece opens with a black screen, ambient typing noise, and inviting phrases that the reader will recognize from various social networking platforms. As text appears and disappears, the nebulous background coalesces into two ghostly images, faces reduced to abstractions. The audio, video and starkness of the piece serve the mood very well, imparting feelings of loneliness and uncanny horror. Brian Kim Stefans’s assessment that there are “echoes of The Scream” in this piece is certainly founded. The ghastly monochrome visuals evoke feelings of detachment, curiosity, and repulsion that are all a part of the online experience. The lines of text often complement the other media well, but the places where they don’t are too numerous to ignore. 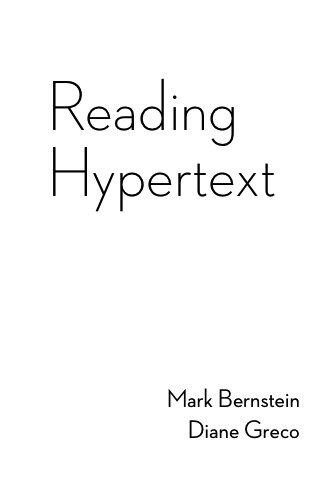 I’m reading this with acute awareness of the postmodern, and the aesthetics that generative works have contributed to digital poetry, but I grow tired of the poets—presumably caught up in the quest to combine words in new ways—forcing the reader to decipher or impose meaning onto nonsensical phrases. Some lines are clear and resonant: “Do I mean anything to you?” But these are often overshadowed by cryptic lines like “You’re too touchy typey” or “Dream me texts” that are grammatically on par with generative poetry. The words themselves are not sufficiently emotionally charged, not effective forms of rhetorical devices, and not presented in such a musical rhythm as to excuse the lack of clarity. There are many arguments for why these lines might work—fractured language symbolic of fractured relationships, a reflection of online communication, it’s fashionable in digital poetry—but the piece does not gain anything from such grammatically fractured lines that couldn’t have also been achieved through clearer language. Still, the visuals are powerful, and the work as a whole successfully explores loneliness and the fetish (and artifice) of human connectedness inherent in social media, a theme to which many of us can relate.